Smaller than its European cousin, the African Wild Cat, also known as African Desert Cat, appears to have evolved as a separate species many thousands of years ago. Its coloration varies from sandy yellow to gray as it ranges from arid to forested habitats. Body length is around one half to three quarters of a meter with weight ranging from five to fifteen pounds. Fur is short and marked by tabby-like spots and stripes. Tail is somewhat pointed and fur behind the ears has a certain reddish shade. Primarily a nocturnal hunter, crepuscular activity is often recorded in territories uninhabited by humans. Hunting is through the stalk and ambush method. Small mammals including rodents and mice are generally taken, along with reptiles, insects and birds. Males are territorial and protective of their domain, that often includes ranges of a number of females. Highly adaptable, the wild cat, Felis Silvestris Lybica, is seen in a variety of habitats including bush country and plains. The geographical range includes large parts of Africa excluding the rainforests of Central Africa and some of the extreme regions of the Sahara desert. It is also recorded in certain coastal areas of the Middle East. A number of subspecies (ten to fifteen) are recognized but owing to the considerable similarities amongst them, the classification system is widely disputed by scientists. Litter size of the African Wild Cat ranges from two to six babies, with three being the norm. Pregnancy lasts around two months and conception is often timed so that the kittens are born in the rainy season when food supply is plentiful. Independence is reached at six months and sexual maturity at twice that age. Like other wild cats, the principal threat to this beautiful feline is from hybridizing with feral and domestic cats. Conservation strategies include breeding programs for maintenance of the pure gene pool at least in captivity (with future aims at reintroduction in the wild) and management of feral cat populations in the wild. This is the sweet looking housecat! Love your series and I'm so glad you continue to do it. The problem we have in Africa with these cats is the inbreeding with domestic cats, so as a result if we find any domestic cats on the reserve we try and destroy them. This is a cute cat. I wish I had all the cats in the world, but then I would be dead in a second! I get not wanting the domestic cats to breed with the African Wild Cats - but destroy them? Pathetic, moron... you should be destoyed! Waste of space human that lacks humanity. hi whats up that cat is so cute i want one do u know where to buy one my daughter would love it i think im going to buy her a snow leopard but shhhhhhhhh dont tell her its a surprise tehe!!! Thanks for stopping by and admiring the African Wild Cat. Like all other wild animals, its interests are best served by a free life in the wild, and not in captivity. Thanks for your interest though. You can show your love for this cat and help it and many other endangered felines by contributing to animal welfare and conservation groups. my cat is half brown tabby and part african wild cat! he is so cool! I LOVE WILDCATS!! I wonder if we will domesticate them over time. KEEP POSTING!! This helped me in my geography class for a slide show for african big cats! thankz! I think I may have one.He's a stray and will only let my mother,my sister and me pet him(it took a year to tame him) and he isn't scare of dogs.Larry is larger than your ordinary cat and he has large ears and a wild looking face.We saved his life from a bladder blockage last fall and he loved us ever since. I read the Domestic short hair in Europe,Australia and America was imported from Africa because the European wildcat could not be domesticated. Yes European cats can not be domesticated that's what I have heard as well! 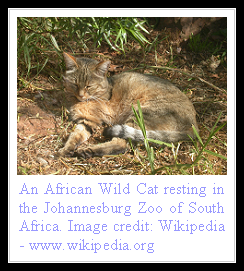 My cat is a domesticated African Wild Cat - I adopted him at the age of 11.5 years. I was told he is Abyssinian but he ISN'T - he is literally the pure form of the wild cat. He is a beautiful and fantastic companion, incredibidly inteligent and can be walked on a harness. I would recommend the wild cat as a domestic pet -IF- it can be contained. They love to roam and run around and hunt but unfortunately, see all other cats and dogs as 'the enemy' and will fight to the death. My cat is 19 now and has a few minor ailments but he will not hesistate to flare up at another cat or dog, he has injured himself and other animals quite severely so now he is indoors only and walks on harness, which he enjoys. I love him so much I can't say too much what a wonderful beautiful pet he is. awwwwwwwwwwwwwwwwwwwwwwwwwwwwwwwwwwwwwwwwwwwwwwwwwwwwwwwwwwwwwwwwwwwwwwwwwwwwwwwwwwwwwwwwwwwwwwwI have cats they are cuuuuuuuuuuuuuuuuuuuuuuuuuuuuuuuuuuuuuuuuuuuuuuuuuuuuuuuuuuuuuuuuuuuuuuuuuuuuuuuuuuuuuuuuuuuuuuuuuuuuuuuuuuuuuuuuuuuuuuuuuuuuuuuuuuuuuuuuuuuuuuuuuuuuuuuuuuuuuuuuuuuuuuuuuuuuuuuuuuuuuuuuuuuuuuuuuuuuuuuuuuuuuuuuuuuuuuuuuuuuuuuuuuuuuuuuuuuuuuuuuuuuuuuuuuuuuuuuuuuuuuuuuuuuuuuuuuuuuuuuuuuuuuuuuuuuuuuuuuuuuuuuuuuuuuuuuuuuuuuuuuuuuuuuuuuuuuuuuuuuuuuuuuuuuuuuuuuuuuuuuuuuuuuuuuuuuuuuuuuuuuuuuuuuuuuuuuuuuuuuuuuuuuuuuuuuuuuuuuuuuuuuuuuuuuuuuuuuuuuuuuuuuuuuuuuuuuuuuuuuuuuuuuuuuuuuuuuuuuute!!!!!!!!!!!!!!!!!!!!!!!!!!!!!!!!!!!!!!!!!!!!!!!!!!!!!!!!!!!!!!!!!!!!!!!!!!!!!!!!!!!!!!!!!!!!!!!!!!!!!!!!!!!!!!!!!!!!!!!!!!!!!!!!!!!!!!!!!!!!!!!!!!!!!!!!!!!!!!!!!!!!!!!!!!!!!!!!!!!!!!!!!!!!!!!!!!!!!!!!!!!!!!!!!!!!!!!!!!!!!!!!!!!!!!!!!!!!!!!!!!!!!!!!!!!!!!!!!!!!!!!!!!!!!!!!!!!!!!!!!!!!!!!!!!!!!!!!!!!!!!!!!!!!!!!!!!!!!!!!!!!!!!!!!!!!!!!!!!!!!!!!!!!!!!!!!!!!!!!!!!!!!!!!!!!!!!!!!!!!!!!!!!!!!!!!!!!!!!!!!!!!!!!!!!!!!!!!!!!!!!!!!!!!!! @ Anonymous: they are capable, we had a couple of run ins when he was younger. Once spayed or nuetered, this helps. I unquestionably getting a charge out of each and every piece of it. It is an awesome site and pleasant offer. I need to bless your heart. Management Of Cash Homework Help is needed for fixing the working capital shortness, to speed up the business operations, to keep the solvency of the business and so on. Cash management lowers the time which is taken to pick up the cash. This site and the resources you provide is really nice Corona App Development Service keep it up.